I’m pretty excited about this post, because it’s going to provide you with immediate ROI. Do you ever feel like there are just too many marketing strategies to choose from? Where do you even begin? My favorite part about marketing is that it’s always changing. What worked yesterday might be useless today, or it could be five times as effective. Unless you’re an industry leader, change is your best friend. It’s your opportunity to close the gap, create a new solution, or even just catch up in the marketing game. In this post, I’m going to give you 3 can’t-lose strategies for 2015. That’s not a hook to keep you reading. I’m dead serious. You CAN’T LOSE with any of these strategies, and if you’re like me, you’ll be hitting all 3 of them before your shiny new calendar expires. Which one will impact your conversion rates most? Well, to know that, you’ll need to test, won’t you? The good news is, they can all three help you reach your goals. So it’s more a matter of where to start than which one is best. So let’s begin. Case studies are the ultimate content goldmine for any company blog. If you haven’t been publishing case studies, you should start right now. Forget the drudgery of topic creation. When it comes to case studies, your business activity already supplies the core content. If your business is legitimate, you are solving problems for your customers or at least meeting some type of need. When you do this successfully… boom… there’s your content. You can’t have a copy case study, because no one is going to solve your client’s problem exactly like you did, and if they had, that client wouldn’t have hired you. Cases studies immediately cut through the List Post noise and repetitive drudgery we writers are forced to produce for the online masses. They are refreshingly unique and, when done correctly, offer a practical how-to guide for replicating the results — which is really what readers want in the first place. Case studies are the ultimate billboard for your business. When you publish a case study, you are essentially announcing how good you are at what you do, and everyone is cool with it. Case studies immediately catch the attention of anyone wanting to replicate the results, i.e., potential clients. While more traffic is nearly always a good thing, ultimately, you’d rather have 10 targeted visitors and 3 buyers than 2,000 random visitors and 1 buyer. Case studies let you attract primed consumers to your business. Here’s the kicker: with a good initial marketing push to get the word out, other websites in your niche will line up to re-publish your case study. A well-written case study is like a free advertisement on all your competitors’ websites. A good case study will be cited by marketing writers for the next 5 years. I know. I’m a marketing writer. Case studies are ultimately the “proof” of a marketing concept. Any time I make a claim, no matter how obvious, I’m looking for case studies to back it up. And when I find them, guess who gets a high-PR backlink, free of charge? So here’s your case study. Brian Dean’s relatively new blog Backlinko was struggling to gain traction after nearly a year on the web. He decided to publish his first case study, and it took off, landing him links from over 158 domains. Since then, he has continued to publish case studies and grown his blog to over 90k visitors a month. Or how about Brian Harris, who has grown his email list to 10k subscribers in under one year with a blog devoted solely to marketing case studies? Case studies work and if you have a business, you already have the content. Here’s a viral case study explaining how to write great case studies that go viral. If you’ve been watching closely, you may have noticed a new trend over the last year. Simple software tools are being offered as free opt-in bribes. Whether it’s QuickSprout’s website SEO analyzer, HubSpot’s website marketing grader, or Moz’s Open Site Explorer, free tools attract people to your website. The beauty of this strategy is that it works in any industry, and it’s far more compelling than an information product. The key is to think about your target market and what sort of simple tasks you can help them with. Calculators are a great place to start. If you are in the fitness industry, you could make an easy-to-use calorie calculator. If you are in banking, you could do a mortgage calculator. If you have a blog on relationships, you could build a free compatibility calculator. Many businesses actually start with something like this and then expanded it into a premium product. 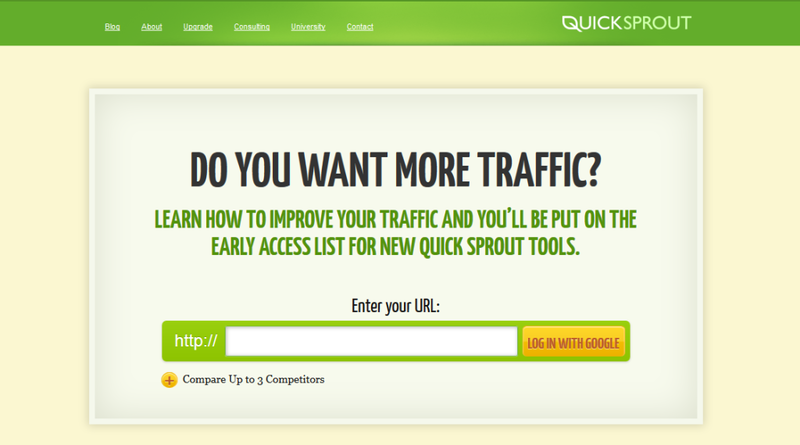 But if you have a premium product already, why not create a simple, free tool to help drive and convert traffic? According to Neil Patel, this strategy has the highest ROI of any he’s ever tried. And that’s saying something. The idea of conceptualizing a new piece of software and paying to have it built might seem intimidating and expensive, but it doesn’t have to be a complicated process. Find people who have done it already and ask them to refer you to people they worked with. And by the way, before you burn your half-finished ebook with digital fire, let me just clarify that the age of the free ebook isn’t over. The age of the weak, hastily put together offer than reels in thousands of subscribers, however — that age is LONG gone. A compelling piece of content with an enticing headline will always get the job done. 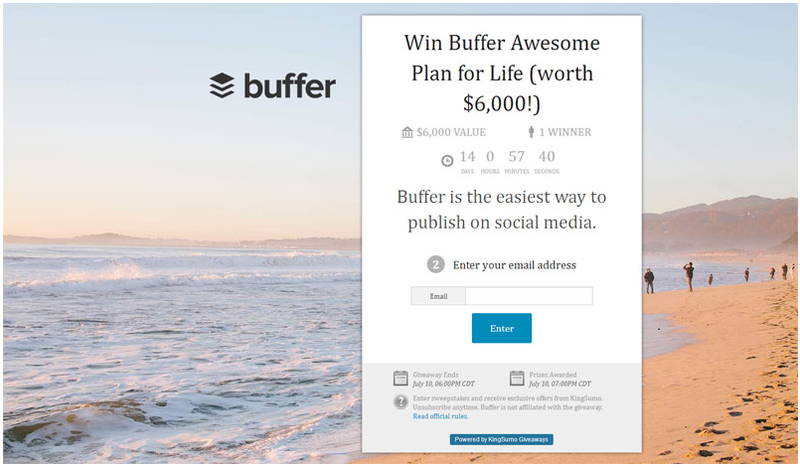 If you don’t have any opt-in offer on your site, go ahead and start there. But if you’re ready to take things to the next level in 2015, create something useful for your audience, build it, and then write a case study about it so I can link to you. Last but not least, if you don’t host a giveaway at some point in 2015, you’re a cotton-headed-ninny-muggins. This is basically the lowest hanging fruit on the true. It’s actually touching the ground. Raise your hand if you like free stuff. Giveaways, if done correctly, are a surefire way to blow up your email list and flood your site with traffic. They’re a form of gamification, if you think about it, which may be why they work so well. The key is to host them properly, and to do that, you need to do 2 things. Solve the ultimate problem with giveaways. Don’t worry! I’m about to tell you exactly how that problem is solved. If I enter a giveaway, my odds of winning decrease with every additional entrant. Why would I tell people about it? To solve this problem, you need to run your giveaway in a manner that increases a contestant’s odds of winning with each additional entrant they bring to your giveaway. For example, you would get 1 point for entering my giveaway and 3 points for every entrant you refer. This means that your odds of winning increase by 66% with every entrant you refer. This also means, if you really want that prize, you’re going to be spreading the word like nobody’s business. It’s really that simple, and you can create this exact type of giveaway in less than 10 minutes using the KingSumo Giveaways app. If you’re using a major email platform like GetResponse, simply plug in the API and you’re good to go. If you’re using a smaller provider, check first to make sure it can integrate with the giveaway app. I’m sure there are a number of tools you can use to accomplish this, but I’m referencing KingSumo’s app because it’s the exact tool Bryan Harris used to nab 2,239 email subscribers in only 10 days. Unimpressed? How about 60,000 subscribers in just 10 days? Those are the numbers Josh Earl picked up using KingSumo Giveaways. If you think about it, this all makes a lot of sense. You are offering a targeted audience a chance at something they want, free of charge. Want to sweeten the pot? Grab that ebook you almost burned earlier and throw it in as a consolation prize for the non-winning contestants. This costs you nothing and lets you immediately provide introductory value to your host of new subscribers, many of which may have never even heard of you before. It’s a win-win, just like running a giveaway. I rarely use the phrase “can’t lose” when not discussing steaks or coffee. This is one of those rare moments. I mean, be smart about the whole software tools thing. It should be simple and thus, relatively inexpensive. If you’re a business owner who is brand new to the idea, cap your expense at 5k for the first go-around. But other than that, these 3 strategies are my exclusive picks for can’t-lose marketing in 2015. Go do them. Then write your case studies. I’ll be looking for them. Read other Crazy Egg articles by Jacob McMillen. The post 3 High-Converting Marketing Strategies Tailor-Made For 2015 appeared first on The Daily Egg.